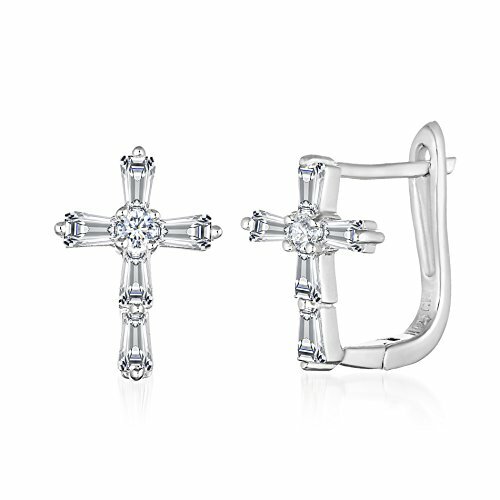 MIA SARINE Baguette and Round Shaped Cubic Zirconia Cross Huggie Hoop Bridal Gift Earrings for Women in 925 Sterling Silver Mia Sarine jewels are classic, timeless and traditional masterpieces that have been hand crafted to give the perfect amount of bling to your outfit. Fashionable to wear everyday, yet stylish enough for special occasions. The best way to care for your jewelry is to make sure it is the last thing you put on and first thing you take off. Avoid exposing it to chemicals, like chlorine, strong detergents and ammonia that could damage the finish. If you need to clean your jewelry, a simple soak in warm water and a light brushing with a very soft toothbrush and a gentle wipe with a soft cloth should do the trick. Never sleep or work out in your jewelry. Avoid sonic jewelry cleaners as this can loosen stones set in soft metals. 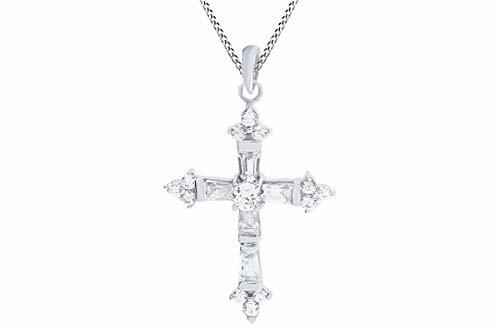 MIA SARINE Baguette Cubic Zirconia Cross Pendant Necklace for Women in Rhodium Plated 925 Sterling Silver Mia Sarine jewels are classic, timeless and traditional masterpieces that have been hand crafted to give the perfect amount of bling to your outfit. Fashionable to wear everyday, yet stylish enough for special occasions. The best way to care for your jewelry is to make sure it is the last thing you put on and first thing you take off. Avoid exposing it to chemicals, like chlorine, strong detergents and ammonia that could damage the finish. If you need to clean your jewelry, a simple soak in warm water and a light brushing with a very soft toothbrush and a gentle wipe with a soft cloth should do the trick. Never sleep or work out in your jewelry. Avoid sonic jewelry cleaners as this can loosen stones set in soft metals. This Lovely Pendant is an ideal gift to your loved one or celebrate your personal style to changing, growing and evolving romance with this exceptional fashion jewelry. 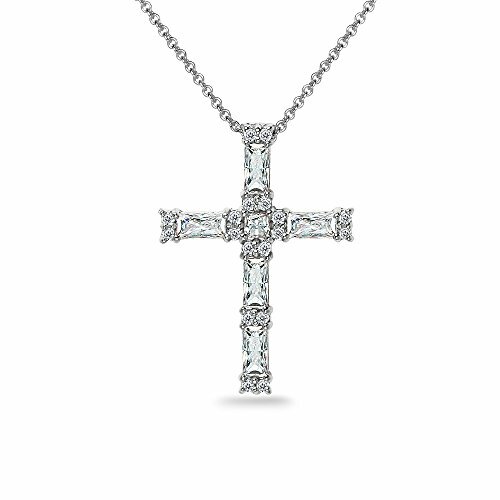 Featuring This Tapered Baguette Cut White Cubic Zirconia Cross Pendant Necklace In 14K Gold Over Sterling Silver Simply Beautiful!! 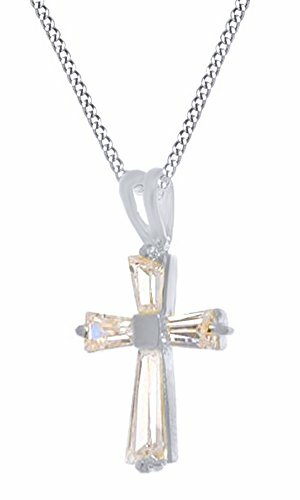 It Is a beautiful piece that complements your personal style with this jewelry for any special occasion like Mothers-day, Wedding, Engagement, Valentines-day, Anniversary,Birthday,Party, Prom and Christmas & so on..
My Bible Rainbow Baguette Cubic Zirconia Cross Pendant for Women in Rhodium Plated 925 Sterling Silver My Bible religious jewelry is a beautiful and wearable symbol to make your personalized statement of faith. Inspirational Crosses , Rosary , Crucifix , Virgin Mary Icons , St. Jude Medallion , Praying Hands , Angel and other Christian themes can be found in the My Bible collection. Jerusalem Nano Bible Technology styles feature microscopic scriptures for Christian and Jewish believers who want to feel blessed . The best way to care for your jewelry is to make sure it is the last thing you put on and first thing you take off. Avoid exposing it to chemicals, like chlorine, strong detergents and ammonia that could damage the finish. If you need to clean your jewelry, a simple soak in warm water and a light brushing with a very soft toothbrush and a gentle wipe with a soft cloth should do the trick. Never sleep or work out in your jewelry. Avoid sonic jewelry cleaners as this can loosen stones set in soft metals. This Lovely Pendant is an ideal gift to your loved one or celebrate your personal style to changing, growing and evolving romance with this exceptional fashion jewelry. 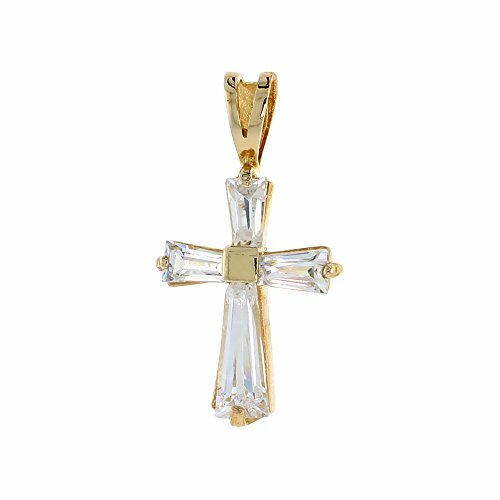 Featuring This Baguette Cut White Cubic Zirconia Cross Pendant Necklace In 14K Gold Over Sterling Silver Simply Beautiful!! It Is a beautiful piece that complements your personal style with this jewelry for any special occasion like Mothers-day, Wedding, Engagement, Valentines-day, Anniversary,Birthday,Party, Prom and Christmas & so on.. 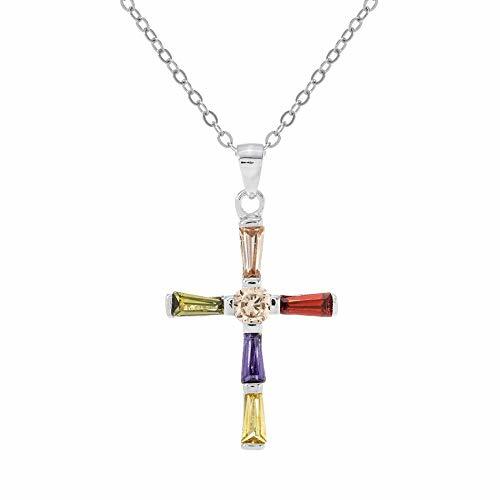 This Cross pendant is crafted from Solid Sterling Silver. It is Gold-plated and has White Baguette Cubic Zirconia Stones. A cool gift for kids and adults alike. 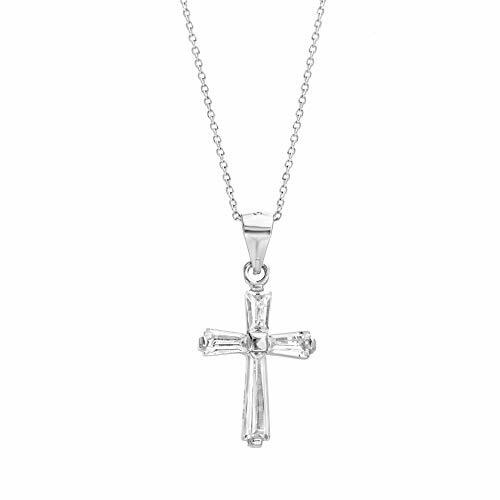 MIA SARINE Cubic Zirconia Baguette Cross Pendant on 18" Necklace for Women in 925 Sterling Silver Mia Sarine jewels are classic, timeless and traditional masterpieces that have been hand crafted to give the perfect amount of bling to your outfit. Fashionable to wear everyday, yet stylish enough for special occasions. The best way to care for your jewelry is to make sure it is the last thing you put on and first thing you take off. Avoid exposing it to chemicals, like chlorine, strong detergents and ammonia that could damage the finish. If you need to clean your jewelry, a simple soak in warm water and a light brushing with a very soft toothbrush and a gentle wipe with a soft cloth should do the trick. Never sleep or work out in your jewelry. Avoid sonic jewelry cleaners as this can loosen stones set in soft metals. 1/2 Carat T.W. 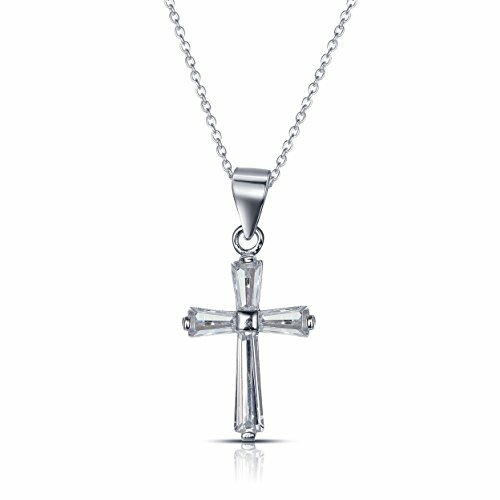 Baguette and Round Diamond Sterling Silver Cross Pendant, 18"
Want more Baguette Cross similar ideas? Try to explore these searches: Plastic Storage Cart, Active 55 Plus Multivitamin, and Bionic Shield.